Saying good-bye to summer has never been easy for me, but I'm slowly starting to get into the spirit. From comfort food and apple cider donuts to cute new outfits and being able to maintain a blow-out in the crisp, humidity-free air, I reluctantly admit that Autumn does have its charms. And one of my favorites is that I can start entertaining again! I'm not sure how it is in your circle, but in mine, summer is always such a blur of travel, weddings, and beach weekends. Nobody ever seems to be in town at the same time, and finding days when everyone can get together is always a challenge. 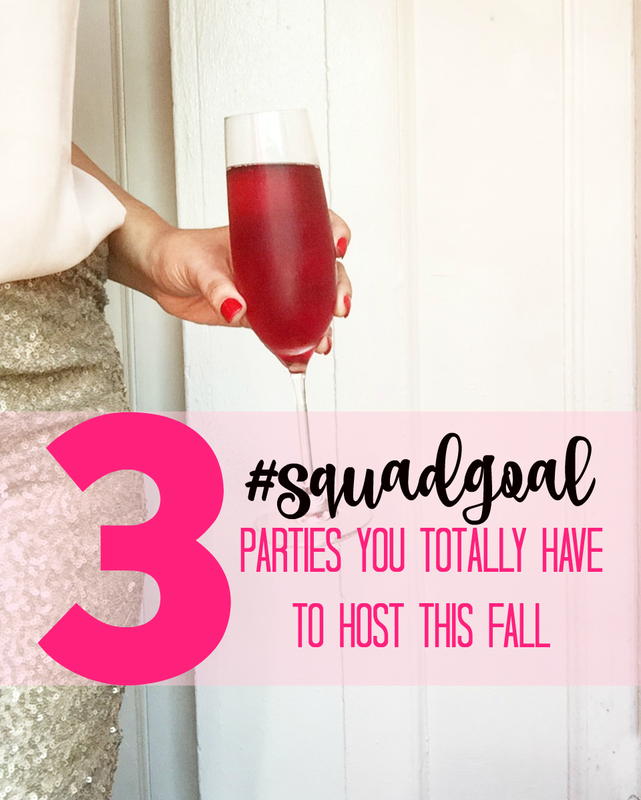 But Fall brings with it a welcome return to routine--and the perfect opportunity to bring your faves together for some much-needed girl time. Girl's night out is always a good time, but after a long week of work, it can usually take me a minute to switch my brain from totally frazzled to ready for a night out. 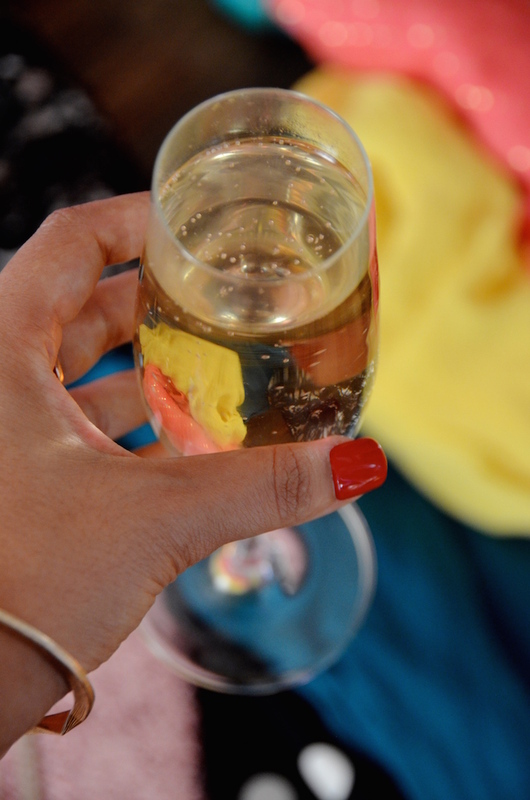 Help your fave ladies unwind before hitting the town by inviting everyone over for a pre-party! Get your outfits ready, crank up the music, help each other with hair and makeup, and Instagram the heck out of everything. Protip: The pre-party is the perfect time to get those very important #aboutlastnight outfit and squad 'grams in good lighting. No blurry bathroom selfies for you! Snacks and drinks are always a must, but you're going out so there is definitely no need for an elaborate spread. And don't forget to pop a bottle and toast to the night! 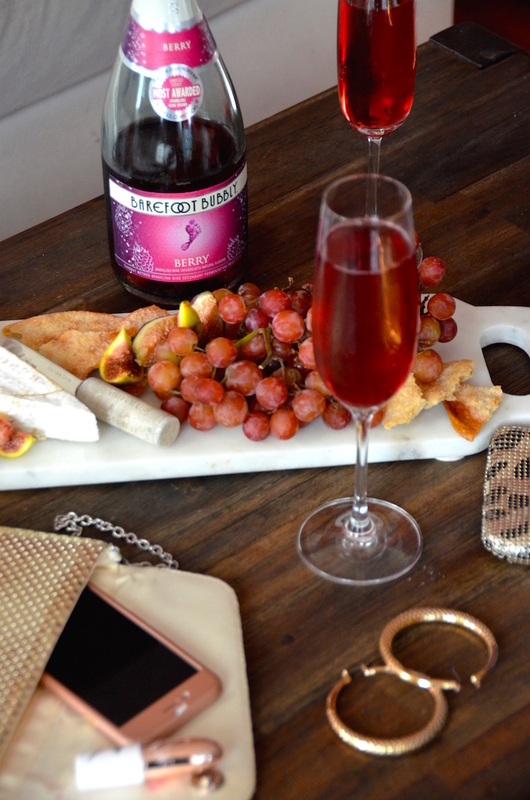 I like Barefoot Bubbly's bright Berry flavor because it is as pretty as it is delicious. One of the things I love most about Fall is that all my favorite TV shows are back! And one of my favorite things about THAT favorite thing is being able to talk about what's going on with my friends. I text and Tweet my way through basically everything I watch on TV, which is cool in its own right, but not as fun as being able to share the experience in person. This year, I'm going to start inviting friends over for chill TV and movie nights at home! Drinks are a must. Prepare for the evening by chilling a couple bottles of something sparkly, like Barefoot Bubbly Pineapple. This super fun sparkling wine has hints of pineapple, mango, and papaya, and is the perfect sip to accompany salty TV night snacks. And about those snacks! 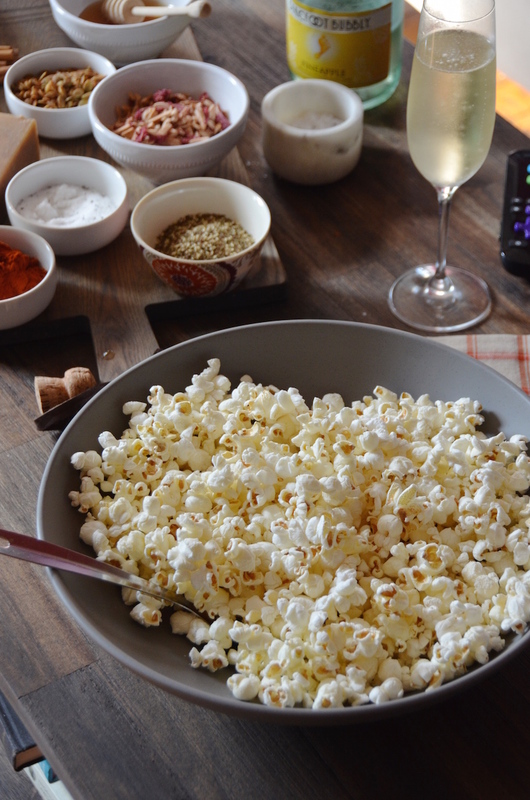 My TV night go-to is a DIY popcorn bar. I know this sounds super elaborate, but it's the easiest thing ever. Start out by popping up a huge bowl of plain popcorn. You can use an air popper or just toss a few bags into the microwave. Then raid your pantry and fridge for possible toppings. Think things like spices and dried herbs (rosemary, oregano, chili flakes, Asian 5-spice, etc. ); grated Parmesan cheese or crumbled feta; crispy bacon; truffle salt or flavored oils like garlic-chili or toasted sesame. I love putting out a few sweet options, too! A bottle of chocolate syrup or chocolate chips, ground cinnamon, brown sugar--anything goes. Set this all up on your coffee table, along with an ice bucket for the bubbly; this is key so that nobody ever has to get up from the couch or leave the room (can't be missing any important scenes, after all!). I've been telling you guys about clothing swap parties for years, and if you still haven't tried it, you absolutely must do so now. The new season is the perfect time to breathe new life into your wardrobe, without even setting foot in the mall! Here's the plan: send an email to all your ladies, and tell them to go through their closets and pull out the stuff they never wear anymore. Dresses, coats, shoes, purses, jeans--everything is game! Then pick a day and have everyone haul it over to your place. Then just go for it! Take turns trying on outfits and styling each other, sharing tips, and catching up on your lives. Because clothing is the focus, you want to keep the refreshments really simple. 1 or 2-bite handheld treats like mini sandwiches, sprinkle-topped cake pops, or even chocolate covered strawberries are the best way to go. Nothing super saucy or messy so that it doesn't get on the outfits. Glam it up with bubbles served in flutes. This party is all about variety so keep a few options available for the ladies to pick their favorite. 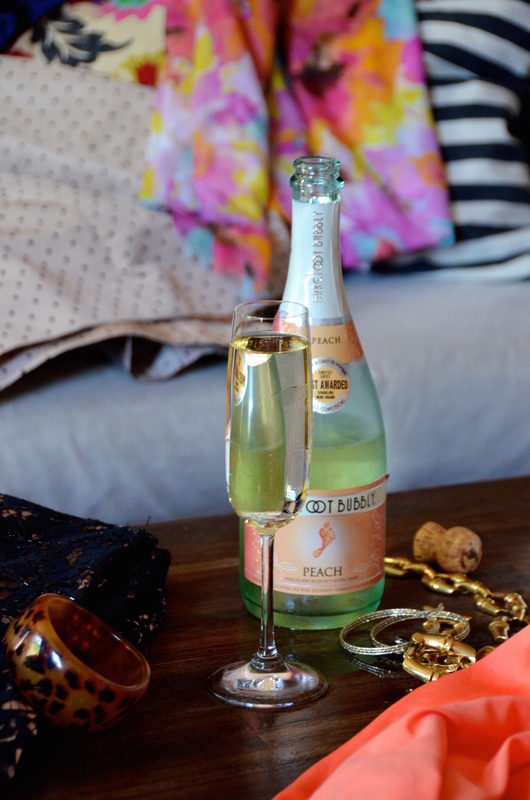 I’d suggest Barefoot Bubbly Peach, which is reminiscent of a classic Bellini! At the end of the day, gather up any clothing that goes unclaimed (there will always be a few stragglers), and pack it up to bring to your favorite charity. Clean closets, a charitable donation, and new outfits for all--total entertaining win! Thanks to Barefoot Wine for sponsoring this post, and making it possible for me to keep creating new content and recipes for you! I was compensated for this post, but all ideas and opinions are my own. Please remember to always drink responsibly. For more ideas and information, visit BarefootWine.com.